This recipe was inspired by Wigilia – a Polish Christmas Eve Celebration. As a kid my mom would prepare some type of simple white fish dish. I put together this recipe the first year I celebrated Wigilia away from my mom. The recipe is simple, but delicious and uses several seasonal vegetables available in a autumn/winter CSA. Combine wine through salt, mix well and set aside. In a large 13X9″ baking dish toss sauce and julienned vegetables. Roast vegetables in oven for 20 minutes – stirring every 5 minutes. Sprinkle a little salt and pepper on both sides of each filet of fish. 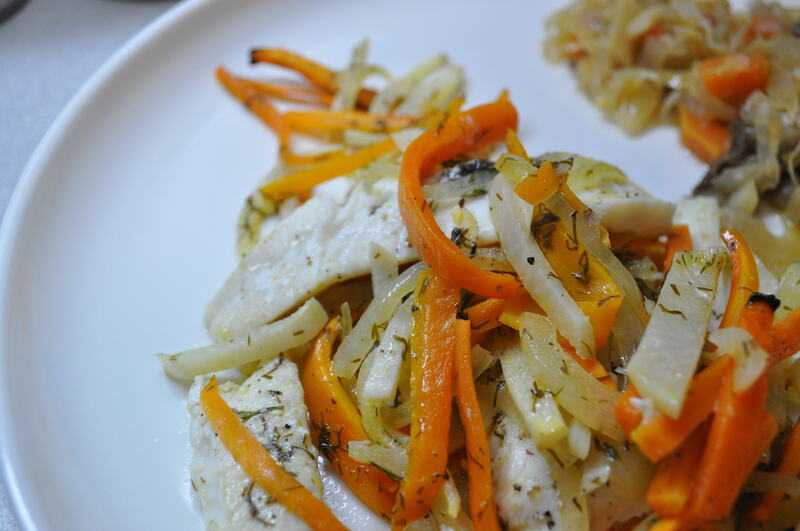 Gently lay the fish filets on top of the roasted vegetables. Slightly cover the filets with some of the roasted vegetables. Bake at 450 degrees for 5 minutes. Flip the fish filets and bake an additional 5 minutes or until the fish are flaky and firm to the touch.